Betcha ya weren't expecting these this week. I can't remember which Cold Wars it was that I split these packs of Sash & Saber 40mm F&IW Indians with Rob. It will suffice to say these aren't a new purchase. So what are they doing here? Well......, despite being distracted by sorting and refitting 25mm ancients, my mind has been spinning its wheels in the mire of such things as when to use 1:1 skirmish rules vs small unit rules (ie MacDuff) , designing a low level scenario on the cusp of these two, deciding what troops to paint next and what needs to be cast or sculpted before I can start, and what scenario to play this week, in which period and with which rules. The figures in the picture need to be assembled, but I don't have to cast 'em! I have a sneaking feeling that it may have been mention of spares boxes that led me to rediscover them after I spent some time rifling through drawer after drawer (those little plastic nuts and bolts cabinets) of leftover heads and weapons and bodies (a grisly sight to be sure). Mind you these were in the queue rather than spare parts though they have contributed various bits. (well I say queue, more of a disorderly mob really, waiting for a cue) They won't fit in with my glossy 19thC toy soldiers but they will go perfectly well with my chunky, shaded, matte F&IW / AWI collection. (Which, oddly enough, is why I originally bought them! How clever was that then?) So, while I mull over the rest, I'm going to glue these warriors together and put their paint on for them. There is no doubt that a good proof reader would be handy. Having fixed all the errors yesterday, I've just correct a sluagh of typos, obsolete references, etc that crept back in while I was sleeping as well as adding some clarifications around formation changes. The link to the latest draft of MacDuff is back on the list to the left. As often happens, after developing some 'clever' and increasingly complicated rules, a walk in the cold air revealed a simple solution to my twin problems of increasing the vulnerability of units reforming after melee and encouraging players not to blaze off at long range. All I had to do was simplify the reaction rules and remove the various penalties. Basically, units which have not fired, fought in melee or moved over 1/2 move yet this turn, can react by shooting, charging or retreating 1/2 move or changing formation if the enemy shoots at or charges them or walks across their front within 6". Since a unit can only shoot the once and can't be activated if they have reacted, firing at long range vs an enemy who is likely to close later in the turn is unwise as is returning fire if you want to advance later or wasting battalion volleys on a handful of skirmishers if they are backed by advancing columns. Since troops who have fought in melee, are unable to react, they are briefly vulnerable to a counter attack. Probably works slightly better with the card activation option than with the initiative/igougo option but close enough. Now to come up with a scenario, with luck the snow and freezing rain in the forecast will translate to some gaming time. The latest draft has now been uploaded to google docs. A long but gentle K.I.S.S. As usual, it seemed a shame to take the table apart after just one game. Jerry and I had played a turn or two of HofT and I had been surprised that I couldn't remember simple things,some things seemed to be missing and I was left unsure if the rules did actually work as intended. So, I reset the table on Sunday with slightly reduced forces, reread the rules and played again. To my great relief it was all fine and worked as intended. The solo play through took barely an hour indicating that this scenario is at the bottom end of what I had in mind, which is about as intended. I did go back and reverse a too clever idea of subtracting 1 from defensive fire for troops being charged (to represent the intimidation of the charge) and restored the +1 to chargers instead. Its easier to remember and more intuitive. It also resolves an issue that cropped up about there being no charge bonus when no defensive fire is involved which was not intended. I am also questioning how the reaction rule and the "fired or fought in melee" modifiers to the Orders chart interact. The system works just fine and I still like the idea, but in the heat of battle, even with an annoying clutter of markers, it was all too easy to lose track of who was allowed to react and who had modifiers. It also didn't seem to have exactly the intended influence on player's decisions (including mine). The alternatives include going back to a movement penalty for shooting and a compulsory rally of some sort after melee and just not worrying about it, rather, letting players get on with their battle plans without getting bogged in detail. I need some thought about this, luckily there is no rush as things aren't broken, just not optimal. I'm over due for a coffee with Lentelus anyway so will wait till I can bend his ear on it. 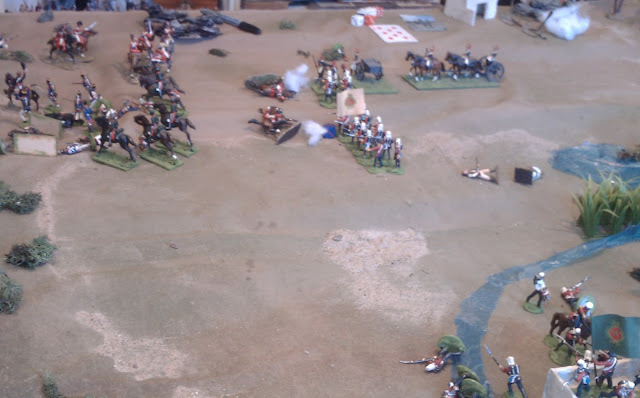 It occurred to me today after reading Bob Cordery's Tuesday blog entry, that the scenario itself could have been played out just as enjoyably on a small grid using MOB with 1 stand per regiment/gun. 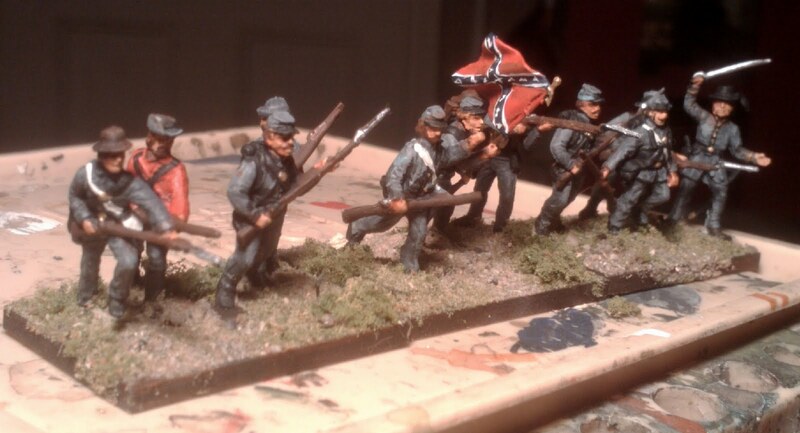 Luckily the ACW venture is as much about an excuse to paint up 1/72nd figures as it is about playing games so I remain happy with where its headed. Anyway, I still retain that option since I can always grab 1 stand per regiment and play MOB or the Portable Wargame once I get a suitable board fashioned. (That's on my list, I want a portable game for the garden, living room or on the road). Anyhow, at this point I was so happy with the 1/72nd ACW game that I began to fret about the future of my glossy 40mm toys and MacDuff. It seemed like an ideal battlefield for War of 1812 or even an Oberhilse vs Faraway bash if I just replaced a few buildings but it was cold out and I was tired of looking at the mangy mismatched summer/winter forest (my goal for this year is now consolidated look scenery for each game). I had just been reading Thackwell's Narrative of the 2nd Sikh War and suddenly had the itch for a Colonial game. I reset with Adobe buildings and my plastic palm trees which look sufficiently unreal to look at home on any table occupied by toy soldiers and scream "this is a warm place, not cold and wintery at all". 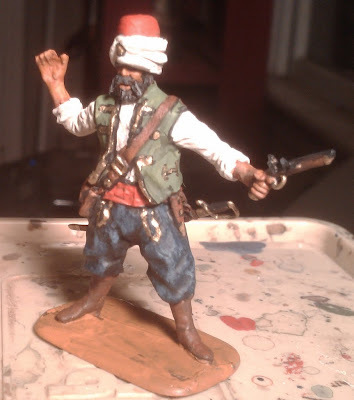 I don't have any Sikhs yet, so hesitated a bit and then started thinking Mexico. A US force marching on a Mexican battery. I only have one unit of Mexicans, but the Peipur Tigers look right at home. What I really wanted were some irregulars, casting my eye about, my glance was caught by the gleaming white of my pirates. Well, the San Carlos Grenadiers have been known to support them before......... Now , for opposition, there has long been speculation about secret Oberhilse support for these "entrepreneurs" and anyway, this whole thing had started with me wanting to get my Redcoats on the table. It wasn't until I caught up with Bob's blog later that I realized where at least part of this urge to go Colonial had come from, his game preview last week must have been in my sub-conscious!. Somewhere in Northern Atlantica, The FTC takes on the competition. Charge! Recently I have found myself praising Charge! publicly in various forums and since I hadn't played a game in ages, this seemed like the time even though it wasn't exactly 18thC linear warfare. I don't have room for full Charge! armies so fielded 8 man Light Infantry and cavalry units and 16 man Infantry units. Not having an opponent to provide surprise and friction, I decided to forgo the simultaneous moves that are one of the strengths of the system and use a card draw system instead. The result was an interesting little action that took about an hour to resolve. 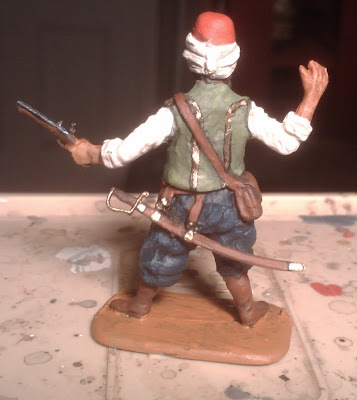 I hadn't really meant to make the pirates equal to British riflemen or have Israel Hands as Gunner, its just that I hadn't really thought about it. Damme! Light infantry and artillery can sure decimate line infantry if their dice are hot! Especially if the infantry spend too much time tootling about and stopping to fire back at long range. Enough said. I decided to call up MacDuff to take out this troublesome battery. It hasn't been that long since I play tested the new version of MacDuff so it was deeply worrying to find myself immediately tripped up. I had movement and ranges messed up, couldn't remember how various rules worked and so on. Stopping to read things over, I realized that the same reaction and orders check issues as encountered with HofT were cropping up. (the mechanisms were similar but different in detail) I had once again tried to get clever and encourage certain tactical choices when the game is not detailed enough to give a proper range of choices and consequences. Picking just one or two to focus on is pretty arbitrary and obscure to players who generally want to just get on with the battle. The choices should be clear and evident, not hidden, and they shouldn't pull player's focus from their battle plan to their subordinate's duties. I had also changed distances that I had used for over a decade to make it easier to one day map the rules to a 4" grid should I ever choose to. Time enough for that if the time comes. I ended up putting the rules aside and running them by instinct rather than by what was written. The result was a very enjoyable, brisk little action. Now, can I turn off my head's desire to improve and adjust long enough to write what I played? The differences are just small details, not main concepts, surely it can be done? Since it was a quick, hastily improvised, game, and this post is already overly long, I will just briefly sketch the main events. The red coated Faraway Trading Company (FTC) column advanced down the road, lancers spurring ahead, rifles working their way through the woods beyond the lake. As soon as the Pirates spotted the advancing column, they quickly turned the gun about and 1 company entered the woods to counter any threat from that direction. The remaining company was uncertain whether to occupy the village or push up to snipe at the red coats so I diced for their reaction. They happily trotted across the stream and up the hill, forgetting all about the battery. It was but the work of several minutes for the lancers to gallop down the road over the bridge and into the battery position. A hasty discharge of cannister brought 1 lancer down but the the crew was cut down or chased away and the battery silenced. The sound of drums approaching from the north announced the arrival of the San Carlos Grenadiers who had been camped just down the road. (Apparently the outpost was technically authorized by the Principality. ) The Buffs, supported by the Rocket Troop, deployed to face the Grenadiers while the Tigers deployed and advanced on the pirate, sorry Volunteer, skirmish line. After a brisk exchange of fire, the former Pirates retreated hastily into the village. Reforming, Larsen's Lancers rode back up the hill, eyes open for an opportunity. Calmly the order came for the Grenadiers to form square. Their flank was in the air but not a man stirred. General Paz (previously San Carlos troops have only appeared as auxilliaries and have not had a General. Their strategic situation is weak, surrounded by stronger enemies, so I thought perhaps they could use a leader who shares the name of a famous general), who had now arrived to command the force, galloped forward to repeat the order in person but the stern Colonel of the Grenadiers refused again despite his flank being in the air. (a 1 followed by a 1). Instead, the 3rd company, which was lagging, was ordered up on the double to cover the flank. They arrived just as the trumpets rang out and were ridden down in an instant. Onward swept the lancers but when they crashed into the main body of the Grenadiers, a situation where military (or rules) experts rate cavalry as being worth double an infantryman, they were rudely repulsed with heavy losses. The General could be heard swearing under his breath but he courteously praised the steadiness of the Colonel's Grenadiers. By now the red coated cavalry of Coast Guard had arrived. Taking no lesson, they formed line and charged the Rocket Battery and the Buffs. A single crashing volley laid low a quarter of their number and sent them reeling. Down the hill, a loud ringing cheer announced at last an assault on the village. The defenders fought hard but the regimental colours rose over the highest building in the village. General Paz gathered his troops and fell back to gather reinforcements. Newly recruited Yanks and Rebs seeing the elephant. In May of 2010, Jerry and I played a 1/72nd AWI game, part of a long standing, occasional campaign set in Nova Scotia, but this time using Black Powder. Having enjoyed the experience, we agreed to assemble 1/72nd ACW armies to play games set in our local area with complete disregard for the politics and history, as if Nova Scotia was perhaps a peninsula in Virginia rather than Canada. Things happen and nearly 2 years passed but on Saturday, we finally brought the idea to fruition. In the meantime, I have played a number of Black Powder games, each less satisfying than the one before, but never for the ACW and I decided that it would be best to at least try them again for this setting. Last year I noted that US Grant's first battle was at Belmont and since I was hosting the game here, in Belmont NS, it seemed like a good idea to base a scenario loosely on that action, but reversing sides since it was it is my Federal Army that is based at Belmont. Having looked at the rules, I decided that a scale of 1":10 yards more or less fit the musket ranges though 1:20 might fit the artillery better. Anyway, we usually measure in cm rather than inches to give ourselves more room. Taking this translation to 1cm on table being equal to 10 Yards to the map, I proceeded to lay out the table. Another friend had presented me with a laminated, detailed, large scale map of my local area a year or so back. Its been propped up on my desk, right up until, well until not long ago. Where it is now is a question which annoyed me exceeding Friday night! Using a slightly larger scale map crossed with memory, I laid out the appropriate section of the table using 1" boards for the contours, occasionally eked out with thin plywood or masonite since 2/3 of the table was above the 1 contour line. The whole was then covered with a cloth with water features being cut out of a translucent blue recycling bag. Its not an exact replica and I spotted a gaff or 2 once it was complete but nothing serious and it was amusing to be able to look down on the table and be able to relate to it having walked much of the area at time or another over the last 6 years. Looking at the rules, the terrain effects didn't sit well for the ACW so we classed the woods as rough or broken (I forget the term) ground rather than woods. I classed the 3rd and 4th contours the same way since they are quite cut up with gullies and patches of woods that I hadn't represented. From an aesthetic viewpoint, a couple of things bothered me about the result. The first is that I needed a lot more trees, bushes and fences. The second is that the cloth is khaki-ish, not bad for a late fall, early spring day but not appropriate from mid-spring to mid-fall. The evergreens were fine and I have a few leafless deciduous trees which fit the winterish look but the bulk of my deciduous trees have green foliage, sometimes scanty but in any case, only appropriate during the spring, summer, fall times where the khaki cloth is not appropriate. I either need a grass green cloth or I need to finish painting all and every bit of wood that I might use as contours, to match my table top. I began the game with a 4 regiment Brigade and 2 guns entrenched on table with the guns and 1 regiment alert and manning the defences, watching for an amphibious assault. The rest of brigade were deemed to be unready for combat and were stood facing some improvised out of period tents (note to self: add ACW tents to the list or things to make). The rest of my force, a regiment of cavalry and 2 brigades each of 4 regiments and a gun would arrive at some point after the alarm was raised, either by boat to the area near the battery or by road from the North, marching on past my house, depending on a die roll. Not having appropriate boats, I used a scratch built under scale ironclad of miscellaneous design that I had scratch built years ago to support my old 15mm F&F ACW armies for CS Grant's Island battle. Jerry began with his entire force within a foot of the southern table edge. A brigade with 2 regiments of cavalry and a horse battery and 3 brigades of infantry totaling 11 regiments, with 1 gun assigned to each brigade. His mission was to capture the battery. If he could hold it, he would get a Victory. If he captured the battery but then extracted his force he would get a Winning draw. He sent the cavalry down the road followed by an infantry brigade with another moving above them. The 3rd brigade was directed down through the woods west of the pond to attack the camp. An alert sentry spotted Jerry's troops on the road on turn 1 but no one believed him and on turn 3 when his infantry stormed out of the woods, I still hadn't managed to get my troops into battle order. Luckily for me, being hit in the rear seems to be a fairly minor penalty in BP and while my unit retreated, it wasn't badly hurt. At least being within initiative distance allowed me to shake out some other units and begin firing. A further charge by the Rebs into the prepared front of my next unit resulted in the rout and destruction of said unit. (first time seeing the elephant for all of these units) Luckily the other lads had rallied and plugged the gap backed by a battery. The battle on this front settled into a prolonged and indecisive firefight. Behind my brigade, as the steamboats busily chugged across the river with reinforcements, Jerry's cavalry had reached the intersection, followed the lane down towards the river, deployed and charged across the stream. Despite every advantage one could ask for, my troops were only just able to hold them at first (drawn melee) but on the next turn he had to retire, Shaken but not Broken. The fight rages, full of sound and fury. By then, my cavalry had appeared, (trotting past my house, wish I had more of those Wagon Train figures so i could have added them by the side of the road), deploying and careening full tilt into the flank of a Confederate regiment. These veteran troops threw them back with heavy losses with out even slowing down their march across the table. The attack worked however. The brigade that had been heading down to take over from Jerry's cavalry and overwhem the battery from the rear, turned about and climbed back up the hill, just as my 3rd brigade arrived. Another prolonged firefight broke out as we each took turns trying to coax our units to sidle into the woods to try to flank the enemy. At last Jerry realized that time was running out as my 2nd Brigade, which had stalled midstream for several turns, finally began disembarking, driving off the few remaining troopers. He ordered a wild bayonet charge against the defenders of the battery. This time closing fire against the already battered regiments was decisive and his Brigade broke, pretty much ending the game. It had been an enjoyable day with much catching up and an interesting game, despite the rules. Reverse perspective: little boat in front, larger figures in the background. Those are Jerry's newly painted cavalry. To my embarrassment, I didn't get any close ups of any of his units despite their being more carefully painted than mind. (and no not because of). Actually, I got so tired of nothing changing from turn to turn that I stopped taking pictures and then forgot to shoot the end until after Jerry had removed his units. Despite enjoying the game, I'm afraid, we both found the rules either frustrating or annoying at times, for various reasons. For me, apart from the stop/start feel of the no move or triple move command rolls, and the short artillery ranges (48" vs 18" smoothbore musket range) which didn't feel right for ACW, the ability of the attacker to always get the first shot, etc the combat wasn't terribly satisfying as a game experience. I know its possible to back build a story as to what happened, why the cavalry that hit the column in the flank were the only ones to take damage and disorder, why the infantry hit while unformed were able to retreat fighting and form up while their comrades formed and facing the attack crumbled and fled and so on but I didn't find it as satisfying as, well lets say Charge! which can also have drastic swings of fortune in shooting or melee but in more up front fashion. You don't lose the combat then win the morale throw reversing the decision. For example a unit in Charge! that takes a walloping in melee due to bad dice will be beaten. A unit that only loses by little will fall back and rally if allowed to do so in peace as opposed to BP where we had units lose badly but shake it off or lose by a hair and then evaporate. Horses for courses. The game also dragged on a little long despite how little happened. Partially this was because we wasted a LOT of time trying to find things in the book and partly because we took so many coffee breaks but that latter bit says a lot in itself. I would now rate the rules as maybe 3 stars or maybe 2 1/2. Just as you take one unit off the painting desk, Whish..then.... KerPlop! another one appears! An 8th Reb regiment to balance the 12th Federal one finished this morning. Gotta keep the playing field uneven. Same mix of Airfix, Imex and Italeri. Anyway, to be clear I'm very happy with the results of the rough and ready approach. The extras would be lost on the table top. Base coat, rough highlights, nearly but not quite dry brushing, and directed wash shading using a appropriate colour for each area rather than a one size fits over wash like I used to use. Slightly fuzzy looking Federal troops. That's not exactly my house but its a similar style, straight off the back of the Imex box. Could use a bit of touch up..
Ok enough painting for now. My 12 Federal Regiments are ready to defend against the combined force of my 8 plus Jerry's 3 Rebel units, but the ground they will fight over isn't. Jerry's forces are expected to embark at Avonport, move up the Avon River, disembark at Newport Landing then march up the Belmont Road to attack the Federal Brigade camped near Wallace Point where the Avon and Kennetcook Rivers meet, across the river from the shore battery at Card Beach. The rest of the Federal Army will be encamped across the river and will have to be ferried across the Kennetcook off table. Both rivers are tidal which poses some interesting challenges which I'll ignore for now. "A" marks my house, (Since it would have been here at the time, I'll be using the one above, it'll be near the edge of the table which will be roughly 2 km by 1 2/3 km.). The Kennetcook goes acroos the top, The Avon is in the side, flowing towards the Minas Basin and then Bay of Fundy. The corner with the clearing is Wallace Point with Card Beach which will be off table is across the river, under the directional arrows. The map is about twice the area that the table will cover. Since I don't want to spend hours making a terrain block of my house (after all, hopefully most of the fighting should be across the Avon River as I push out of Hants County into King's County and down the Valley.) it'll be tricky making even a vague semblance of the terrain, trying to figure out how to translate rolling hills into workable scaled down terrain and squashing the shape for convenience. But, it should be fun too. Right, time for a cuppa then to get on with terra forming. Two hours later, they still need flocking but they'll be ready to fight. Now to go base up another regiment to bring the Feds up to 3 brigades of 4 regiments and a battery apiece. Something Blue. A new Federal Brigade Commander after an unfortunate encounter with a bottle labeled "matte varnish". Past its best before apparently. New Imex and Airfix recruits in the background. Can they be dressed and trained, ready for action by the weekend? Sitting on the Dock of the Bey or What I did today. The first 54mm plastic figure that I've done in years. Aficionados of soft plastic AWI in either scale will recognize the base for this Barbary Pirate chief. Most of the activity this last week, both painting/rebasing and gaming has been Ancients related and thus relegated to the Gathering of Hosts blog. 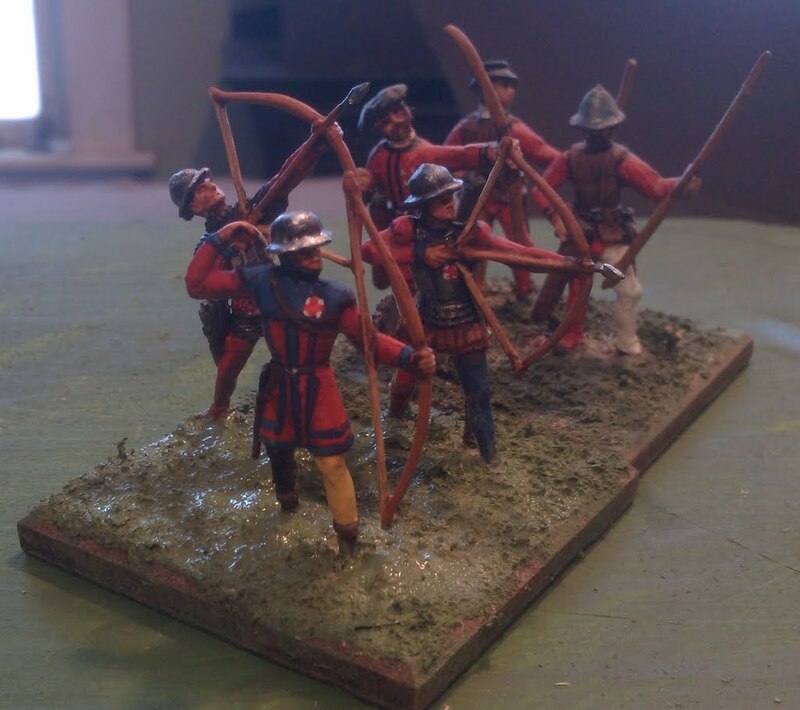 However, I did manage to paint up 1 stand of 40mm Merten archers. They look a little more 15thC than 16thC but not impossibly so. I moved the quivers on 2 of them to the belt but there was no helping the chap drawing an arrow. They still need a lick of varnish and some work on the base when the undercoat and glue are all dry but they are serviceable as is and I'm happy enough with them. Merten archers to the fore, my own home made ones in behind. So with Greco-Bactrians table ready & tried and a new stand of archers, that's 2 things accomplished from my list. The relocation of my painting desk following a re-org of the family room has been backed up a bit as we experiment with layouts and the room clean up and reorg is hurrying up and waiting on that. Looks like a 20mm ACW game next weekend so that'll be the focus for this week. To my great surprise, I find myself with no commitments this week. The first time, in, well, leaving aside the convalescing after my heart attack, the first time in 4 or 5 years! Not that there isn't stuff to do but there's nothing urgent or promised. So, I'm trying to sort out some hobby time priorities for the next little while. Job 1 was finish some of the started stuff that was on my desk. The Horse-less Soldiers. Hmm, I'm going to need a cheap HO vintage railway. how rough the service is that troops can expect under my command and how poor the lighting and my eye sight are, and decided that trimming the muskets to make them look slightly more like carbines would be good enough. A quick under coat in the primary colours, and......there they sat on the shelf till yesterday morning. They have now been finished up in the minimalist style I'm using for the 1/72nd ACW guys and I'm fairly happy with them, My first impression of the Italeri figures was that they were rather chunky but though I hate to admit it, they were enjoyable to paint and I like the look of the finished figures. I feel better now about buying that box of Italeri Confederate infantry (which includes some dismounted cavalry). Some horse holders would be good, and a couple more regiments worth of mounted and dismounted cavalry but at least I have enough stands that I can dismount what mounted cavalry I have with good conscience in the next game. 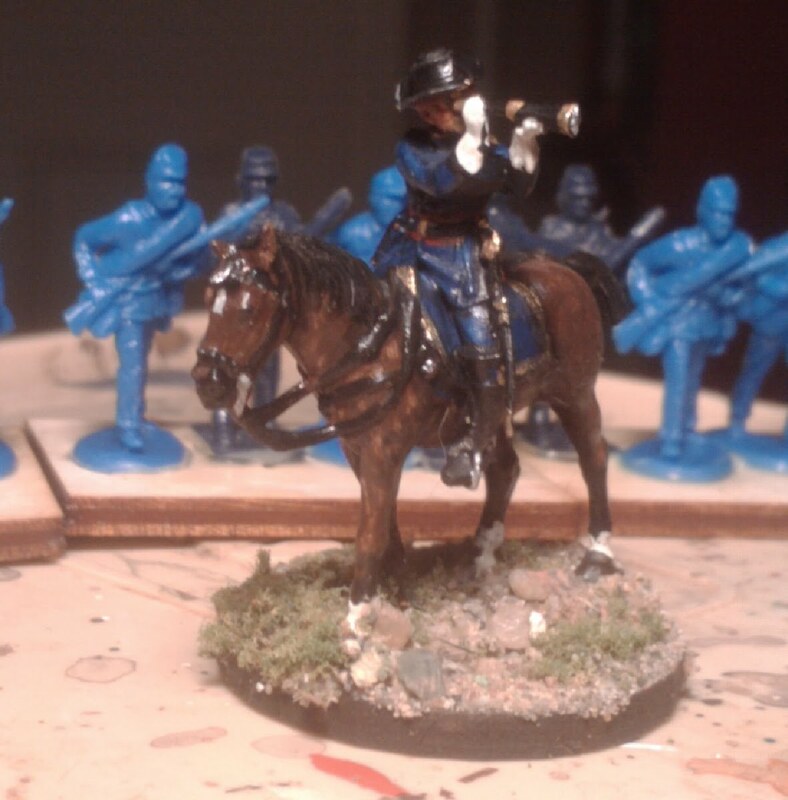 There are some Elastolin dark age cavalry which have been lurking 1/2 painted for nearly 3 years now. I really ought to finish them. (or put them away...) and there's a bunch of ready to be started on things. But where to begin? The other is that my last effort to maximize use of space has left me with nowhere that I can approach my main troop staging areas closer than arms length. When lifting trays of figures, this inevitably results in some tilting and some death defying dives into the dog bed, garbage can or the brush cleaning pot. There is some talk of relocating my painting desk back to the family room. That would help though it raises other issues. (where the heck is the bottle of white paint, uh oh, Travis? What have you got?) Now that the table is smaller some rearranging may help resolve it. Next up is scenery. I've been holding off in part because I'm between camps on style of scenery, and in part because its sheer drudgery for me. Perhaps if I write a blog entry on the topic, it'll help me sort my thoughts and reach some decisions so I'll put that on the list for this week. There is a stack of 1812 figures, but I have no officers. I resumed work on a master this morning but that's going to be slow work, probably a mold of a neutral dolly of the new pose then a mold of a dressed officer. A drummer and standard bearer would be nice too. The plan here is going to be to chug ahead and hold off painting more privates till the officers are ready. 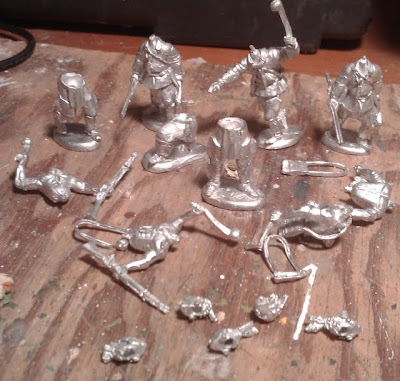 I could use some more English archers and I have some Merten figures on hand, so that might be an easy fix, even if I did one stand. OK that's on the list then. But, above all , I want to get "something" finished. At the moment my prime target is a 25mm vaguely historical Greco-Bactrian army for Hexed Impetus. Partly because it only needs some fixing up, a few figures and some rebasing so should be a short term thing, partly because I hope to see it in action soon and would prefer to see it all tidy like instead of a mish-mash of sabots and various bases. I think that's where I'll start. A screen save of my computer in Nova Scotia at one point in the game. The game was set in France during the early 16thC. The rules were Rough Wooing which we co-wrote and the scenario #32 from CS Grant's Scenarios for Wargamers: Convoy (1): Wagon Train. A tried and trusted scenario. The rules use a card activation system using an ordinary deck of playing cards. Since I was going to be pushing figures, I suggested that Rob flip the cards. Ideally the scenario calls for a GM to manage the arrival of the ambushers as a surprise to both sides. Rob's son Norman was hanging around in the back ground, painting Mongols or the like so I asked if he would do the rolls required and let us know each turn what was arriving. This turned out to be a game winning move on my part. The game progressed with Rob letting me know which group to move, how far and in which direction. ("a bit more to the left" etc) Occasionally he would ask me to shift the camera angle or to measure a distance since it was hard to judge distance using a fuzzy 2d image. When dice needed to be rolled which each rolled our own and reported the results. (There is no point playing a game like this with some one you don't trust). We spent about an hour discussing some rule changes that I had proposed (the rules will be uploaded to Google docs soon) and discussing the mechanics of the web game, then about 2 hours playing 8 turns. In ohter words, about the same time it would have taken if we'd both been physically present. 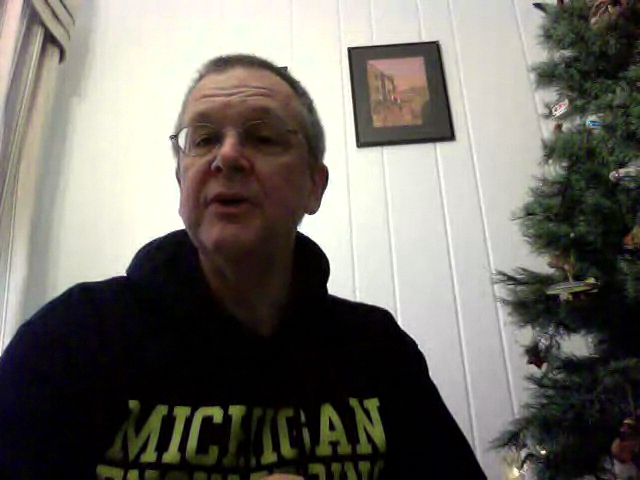 We did not use any special equipment, just the Free version of Skype and the built in webcam. I need to find out more about using my digital camera as a webcam for the future as that would give me better resolution and make it easier to zoom in or pan the table. Enough of mechanics, how did it go? The table was laid out as close to the map as I could manage. The letters indicate arrival times. The convoy can be seen on the right, but the shot was staged as a pre-game look at the table for Rob. I fielded 2 stands or "companies" for each Grant unit. Rob as the English, chose to come on the corner road, as above, but he decided to go left at the first fork and headed for the center road. He had obviously been practicing with his dice as its not easy to coax that many 1's and 2's from them. (the game uses variable length moves 2d6 for the wagons in this case) I maintain that the old driver of the first wagon was dragging his heels because he wanted to take the right hand fork. Rob's order of march was : Commanderand 2 companies of Demi-Lancers followed by the convoy. 4 companies of Bills & Bows on the left, a company of arquebusiers and one of sword & buckler men on the right. Two companies of Border Horse made up the rear guard. My troops arrived early with 2 companies of pikemen arriving in the woods at A while 2 companies of arquebusiers arrived at D, following a trail over a steep hill. On the 2nd turn, my infantry commander and more arquebusiers arrived at D, followed by Mounted Arquebusiers on turn 3. This was all looking surprisingly organized. Nothing else arrived on turn 4 but by now we were close enough to trade shots. I had rashly sent some arquebusiers skirmishing across the plain to shoot at his lancers, hoping to draw them up into the hills after me and away from the road. My shooting was bang on and the cavalry predictably lowered their lances and charged, I prepared to evade to the shelter of the steep hill, or my halbardiers but realized that I'd come too far forward. there was nothing for it but to stand and take it. Amazingly it worked. Rob showed that his movement dice were no fluke, snake eyes while I rolled a fat 6 causing a 2nd hit to the stand and removing it. In my mind it was a close range volley that took them down. A taste of the future. By now the wagons were committed to the center road. Inevitably, on Turn 5, my lancers arrived at Point E, perfectly placed to intercept. At the same time, more pikes arrived in the wood (OK so that wasn't that well organized). Things looked tight for now but Norman's voice had a vaguely chortling sound and I figured either my General and the rest of my cavalry had rolled a 6 and weren't going to make it at all, or else they were coming on at C, right behind the convoy. The view from the fort. The cavalry prepares to sortie as the enemy Lancers ride into range and line of sight of the gun. In the far distance, the cross of St. Denis can just be seen beyond the wagons. Yup. C it was, my General and 4 companies of cavalry were now parked an inch or 2 behind Rob's rear guard. Only some lucky card draws would allow him to make a fight of it. The French cavalry like foxes in a hen house. The odds had been very slightly in my favour and a draw was as likely as any other outcome but the result was drastic and disastrous for the English. The French cavalry pursued, riding over 1/2 the convoy. On turn 7 the English Light Horse from the garrison made a bold dash for the rear of the French lancers but despite a very credible movement roll ended up 4" short. A unit of sword and buckler men managed to get in between the French and the head of the wagons but the horsemen were not to be denied. They rode down the English and 1 company pursued into the wagons while the other crashed into the bows. The game was over. I've played this Wagon Train scenario times when arrival rolls or lack of arrivals made for a very challenging game but I don't think I've ever not enjoyed a play through of this scenario. If the timing and arrival of the reinforcements had been different, if the wagons had rolled even close to average movement or if Rob had listened to the old Wagoneer and risked the right hand road, who knows? 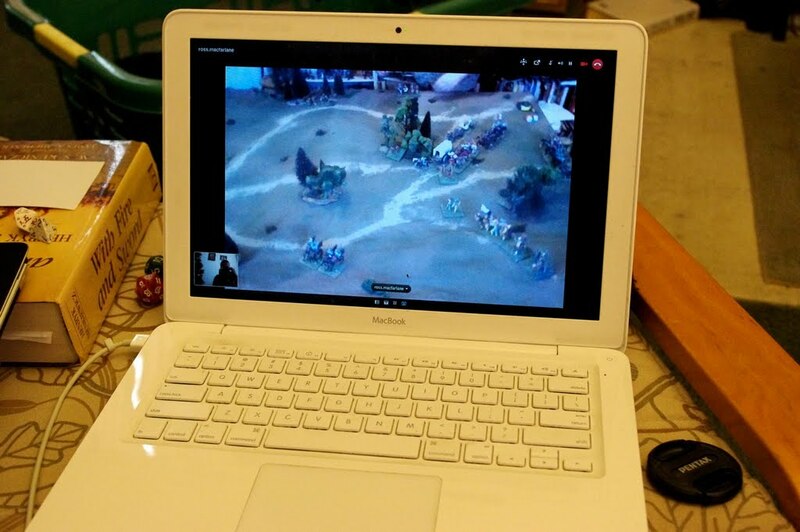 The main thing is that it was fun, and validated the remote game concept. Yesterday morning, an unprovoked attack was made on the new battery established at Torn Point near Belmont on the Blugene River. The Queen's forces in the area were composed of 1/2 a company of the Royal Fusiliers guarding the bridge near Brown Rock, the gunners with their 12 pounder and a company of local militia. These troops were on the Qui Vive however, and at the first sign of enemy preparations alerted neighboring garrisons who rushed to their aid with unprecedented haste. Three companies of Blue's 1st infantry under General Scott landed upstream of the bridge. One was dispatched to hold off reinforcements while another company approached the redoubt at the bridge and opened fire. Despite taking 25% casualties, the Elite soldiers of the Fusiliers stood their ground and with a withering return fire, drove off the attack. The 3rd company soon renewed the attack and forced the remaining Fusiliers to retreat. While some Blue soldiers set to work tearing up the bridge, the rest followed up the Fusiliers who were attempting to make their way across the fields to rejoin their regiment and drove them off. A fresh company of Fusiliers supported by a company of Victoria Rifles was at hand already. Several point blank volleys routed the first company of Bluecoats then a bayonet charge cleared the bridge before the destruction could be completed. The Stone House near the point was attacked by Brigadier Zinn with a company of Rifles and 2 companies of the 2nd Infantry. Brigadier Zinn, led the 2nd Infantry forward in person but a bullet from one of the defenders threw him from his saddle and the attack stalled. The Rifles began to work their way around the House and casualties began to mount amongst the defenders but help was at hand. Rushing up the road from Brooklyn came the Green Tigers led by Colonel Stoneforte. The Grenadiers rushed to reinforce the defenders of the house while the rest deployed and opened a heavy fire. Crossing rapidly over into the adjacent fields, they charged the company of Blue infantry which had been pursuing the Fusiliers. Blinded by their own smoke, the Blue Infantry failed to form square and were ridden down. The invasion seemed well repulsed but Blue was not yet done, The second wave was at hand! Despite the lack of any senior commanders, two companies of the 3rd Infantry and a Mountain Howitzer landed and pushed inland while the Rifles pushed up the road and opened a heavy and accurate fire on the Rocket Battery, forcing them to limber up and retreat. Behind them, another wave of boats landed. The Blue Guards were at hand! Pushing up the road towards the bridge a company of the 3rd opened fire on the Dragoons from behind the fence line. The cavalry wheeled around but as they attempted to jump the fence to get at their foe, a tremendous point blank fire cut them down in droves and the remaining dragoons scattered back to safety. The day hung in the balance as the Blue Guards formed with precision, their Colonel at their head. With a ring cheer they charged the house where the Tigers had replaced the garrison. A volley the likes of which has rarely been known cut down the Colonel and nearly 1/2 the Guardsmen. The remaining Blue troops quickly re-embarked and abandoned their enterprise. Rather than asking the reporter from the Newport Noodle to comment on the plans and thoughts, I'd thought I'd slip in a brief post test post. A detachment of Royal Scots Fusiliers stand to as the Americans Oberhilsians storm ashore. Firstly, I was pleased. The rules had the right feel for this sort of game as I envisaged it. The game reminded me of early MacDuff games but in 2 hours instead of 4 and with a definite end. I'm sure there will be minor tweaks, for example I'm wondering if I should stick with the tried and false but easy 45 degree arc of fire or restrict it to straight ahead but allow fire groups on the end of a line to wheel 45 degrees forward or backward before firing. I suspect that is pedantic and not worth the hassle but its tempting. Secondly, I kept thinking of the forces as British and American. May have something to do with the uniforms....... I'm not sure this Imagination thing will stick or if I'll just go back to straight fantasy with two broadly historical armies fighting each other over imaginary terrain with imaginary orders of battle. No rash decisions on this though, I want to bring the armies up to speed as they are which will leave them able to go either way. OK Battle report by bedtime. Slightly different terrain and twice the forces. Are those cavalry coming down the road? Is that red glare being made by a rocket? The label "Old School" means so many different things to so many people that it is meaningless on its own. To me Charles Grant with his tables of stats and regard for consistent scale is a good example of what we could call Old School Simulationist. But to me the term brings to mind Featherstone and Lawford & Young who discourage becoming a slave to minor details or "dull consistency" in order to get the right over all effect Back in the early 1990's, I had just started playing 25mm Colonials and had been re-reading Charge! for the umpteenth time. MacDuff To The Frontier was the result. I was looking at the latest MacDuff ideas today and thinking back over some of the principles that I've tried to put in writing over the last 2 years (for example see) and realized that various things violated some of these principles and that it wasn't the first time I tried them (for example the artificial menu of Order options). I also realized that the more I stopped trying to prescribe how players are to use their troops and just allowed them to be more or less historical as it pleases them, the easier it got to make the rules simple, quick and effective. Once again, the inspiration here is Charge! If you want to break your regiments down into companies and launch bayonet attacks in column Charge! lets you do it. Its almost guaranteed to fail against a player using historical tactics, but you can try it. Similarly, I am trying to keep in mind what experience has taught me playing MacDuff at conventions or club games with people who are not necessarily familiar with either rules or period. Too many clever bits, meant to increase various historical aspects, often result in "gotcha" moments or confusion. So, I have gone back through the various mechanisms experimented with over the last year, (including some shared by HofT like the Orders Chart) and am now busy incorporating them into the latest version of MacDuff. The result will be posted sometime in the next few days but they are summarized below as a guide to me during the next play test. Long ago and so Faraway.......The 1st and 2nd Oberhilse Infantry Regiments cross the Blugene River in a surprise attack. 1. Scales. Roughly 1”=15 yds, 4 turn = 1 hour. Theoretically each toy soldier thus occupies the same frontage as 1 man for each mm of base. In practice I routinely expand or compress terrain and troop scales when converting historical events into game scenarios thus making them “inspired by” rather than a “recreation of”. 2. Unit organization can be anything agreed upon by the players or as set out by the GM. My own consists of 8 man "companies" which are grouped into 2-4 company Regiments. In a game, while I would normally try to keep the companies of a Regiment in a formation by themselves, but technically a "Brigade" consists of any number of companies (units) and a commander and the player can arrange them in formations as he/she chooses. 3. Formations are the key element of the game. Activation, movement, combat and morale is by formation. Formations consist of an arrangement of 1 or more units from the same brigade. Close order formations must have all figures aligned and bases touching. A skirmish formation may not be more than 1 unit. A unit may only act once per turn other than to respond to the enemy or as a compulsory move so if a unit forms up with a unit which has not yet moved, that unit will be unable to move until next turn. A brief summary of Basic Rules. 1. Sequence of play. 2 options. 1. Basic: Draw cards, Red one side, black the other. On a card one formation is activated, moves and fights. 2. Alternate: Sides roll off at the start of each turn. Winner chooses to go first or 2nd. Active player activates formations 1 at a time as above. 2. Orders. Issue an order (statement of intent) before moving a formation then roll 1 die. 2-6 Obey, 0,1= Cavalry, spearmen and impetuous troops charge if able, others stand and shoot if able, others do nothing. Less than zero retreat. -1 if disordered, -1 if fired or fought in melee since last activated. A general within 8” may join unit and re-roll. Cavalry, Horse Artillery 24” etc Must stop at least 1” from enemy unless charging. -4” to shoot. Movement is forward only, inc wheel. -4” for each turn unless skirmisher or disordered. -4” to limber/unlimber, mount/dismount etc. Terrain -4" cross minor obstacle. woods etc: skirmishers full, inf 1/2 speed disordered. 4. Reaction. If shot at, a unit may return fire or charge. If charged, a unit may fire, counter charge or take command test then change facing/formation. Skirmisher, lt cav or horse artillery may retreat in disorder. 6. Melee Match up front rank figures and dice. High score wins. +1 elite or fighting militia, +1 defending cover or obstacle. +1 infantry charging if they did not fire +2 cavalry charging except vs square or cover. Afterwards. Formation taking most hits retreat full move in disorder. If tie, fight again. 7. Morale. A formation receiving 1/4 casualties (current strength) from 1 shot will retire a move in disorder. A formation suffering 1/2 casualties (current strength) from 1shot will rout and be removed. Militia 1/6 and 1/3rd instead, Elites 1/3rd and 2/3rd instead). In mixed formations, figures will react by their class based on over all % hits. Rest of figures may choose to join a retreat. eg a formation with 6 elites, 8 regulars, and 4 militia takes 1/4 hits. Militia and regulars must retreat, the elites may join them or stand. If it had taken 1/3 hits, the militia would rout and the rest be forced to retreat. Takes whole turn to rally from disorder, no shooting, may face the nearest threat. If 1/2 the units in an army have been destroyed, routed or forced to retreat off table then that army must concede. An American landing parting crosses the Neverwaussie River to attack a British battery near Brown Rock Creek. Their mission is to seize the battery, destroy the bridge and hold until reinforced. One of the first lessons of Rules Tinkering that one learns (or not) is that one has to be careful that ideas or mechanisms from different sources don't clash. When I started back to twiddle with MacDuff, I had in mind various historical situations, various past rule mechanisms that I have used and a process used by Simon MacDowall in Comitatus. This was developed from an ancient eye witness account of a battle between Romans and Germanic tribesmen. (Ammianus possibly? I'd have to go digging to find the author and paragraph again). Essentially this has units closing, exchanging long range fire then if their morale holds and they wish it, closing and exchanging javelin fire then if their morale holds and they wish it, charging into contact. Which is the sort of Horse & Musket era behaviour I wanted to catch within a single turn rather than in multiple turns as would happen with Charge! My first kick at adapting the mechanism assumed that all the units on one side would move then all the units would resolve combat but units would only get to fire once so had to decide whether to shoot early with less effect or shoot later. A quick run through of an attack showed me two things. First the concept worked quite well for what I wanted, given those parameters. Secondly, it might mean moving every figure in a 32 man battalion as many as 4 times in one turn. (Simon had been using elements, generally 1 to 4 in a unit). Work or not, that wouldn't fly, not for me at least. I decided to drop the range and sequence thing and assume that units that rolled low fired at long range while those that rolled up had held fire. Having also decided to keep the traditional MacDuff thing of card activation system with combat and movement happening when units were activated not in separate phases, I now had to deal with units being involved in more than 1 combat in a turn. I also ran into extended fire combats at long ranges so, forgetting my earlier decision, added a long distance modifier and a decision mechanism to allow choice rather than chance to decide whether the attacker would fire on the move starting at long range like the French at Quebec or at close range like the British. 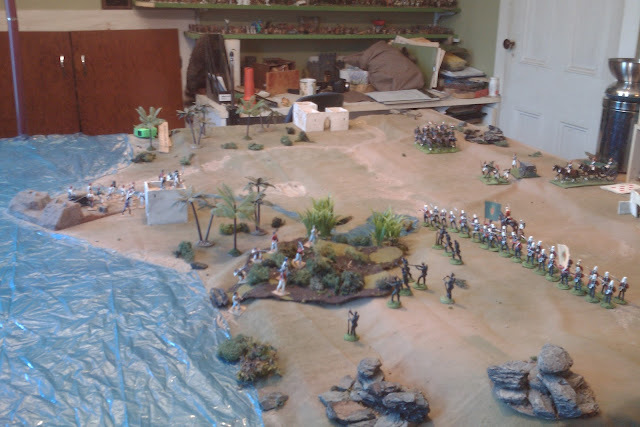 This is what I dropped on the table for a small skirmish based on an action at Black Rock in November of 1812. This is about the smallest game that the rules can handle these days. 6 companies vs 7 once all reinforcements were on table. (or 9 vs 7 if the US reinforcements had opted to come. ) This size of game used to take about 3 hours with the original MacDuff which was good except that I wanted to play games 3 or 4 times this size. This game took about an hour to play through to a conclusion which is about right for its size. The British reinforcements arrive late and both battery and bridge have been taken by the time they arrive. Its always a bit tricky playing a game with 1/2 written rules but I managed to get a feel for some of the issues and ended up finding several situations where things were too vague and I had trouble deciding what would feel best and be consistent and several where what worked for one tactical option, didn't work right for a different one (in terms of feel not success). I liked the idea of the longer move followed by a mutual firefight and resolution and its not the first time I've tried to tackle it ( the Morschauser inspired 3" melee zone from HofT kept coming to mind). I still think it should be possible to separate artillery, skirmish and long range musket fire that cause slow attrition on one hand, from decisive firefights and bayonet charges on the other. In a way the rules originally did this by having the long range fire much less effective, esp if the firer moved, and allowing fire and charge tactics and by allowing units that held fire to react so the answer may well be in the existing and tried ideas rather than revolutionary ones. Just extending the movements, tweaking the reaction and formation change options and the charge sequence might be enough given the new command chart introduced last fall and the revised morale rules, both of which I like. I did like the way the cards worked, making it important to take time to form troops up for maximum effect. For a while I had been playing with certain cards activating certain units but this took that aspect away plus I didn't like the reduction in player decision making that it brought. Oddly, though the system I used was basically how I had done it with the original rules, I had forgotten this aspect of them until reminded by playing Basic Impetus. (no it doesn't use cards but each group finishes its movement and combat before the next starts like original MacDuff where companies needed a Colonel to act together). For bigger battles, the initiative system will probably work better though keeping the "each unit/group does movement and combat before the next starts" concept, in other words status quo with both systems. allowed. One last minor thing, the round washers are so superior to the smaller bases in terms of figures not falling over, and the wider frontage which bothers me in between games was of so little note during the game that I am tempted to tell myself to just stuff it and stay with them. (For those wondering what the issue is, it effects how many real men each toy soldier theoretically represents. Yes, this is the tortured simulationist in me struggling with the Toy Soldier Guy. In the game shown, the numbers present in the historical action suggest each of my figures represents 5 or 10 real ones but the frontage suggests 20-30). The remnants of the last company of Americans looks for a way to get to the boats as the British and Canadians close in from both sides. A Rough Overview of the New Rules. Here is a summary of my thoughts so far. Obviously a lot to do yet and not as drastic or original as my wildest thoughts. As far as I can tell, there is nothing original in any of the rules but I'm not sure I have combined the ideas in exactly this configuration before. There may be just enough MacDuff left in them to keep the name. A Bit of Underlying Rationale. Time is lost and wasted in and around getting things done. In some turns units will be more active and get more done than in others or do some things faster and spend more time waiting. In other turns everyone has finished what they're doing in a minute or 2 or maybe they've actually borrowed time from the next turn to get to where they are. None of this is shown on the table and the game and the turn sequence will march on tirelessly. Perception distorts and thus time travel appears to be possible. "A" appears to happen to a unit early in a turn then "B" appears to happen and changes the outcome. In some cases, A did happen followed by B but in other cases B began before A ended and thus changed the end result. In any event the actual event become equal to A+B if you like and any thing else was just how it appeared to an observer who couldn't see the whole picture. Units have a posture based on their orders, in part this reflects not just where they are now but what they were previously doing. Generals react to what they can see or get reports of but this takes longer and is shown by the orders they issue next turn. Morale is based on melee outcomes and on % losses. This appears deterministic but since casualties are variable it is not. A 32 man unit may fight until it is 3 strong without being forced to retreat or may fight all day and never take a hit since there are no automatic or minimum hits. It does avoid double jeopardy where a combat test indicates 1 result and a separate morale test negates it. Scales. Roughly 1”=25 yds, 1 turn = 15 minutes. Infantry in line move 12” Musket range is 8”, rifle range will be 16", canister 16", shot shell varies varies by light/foot/heavy. My "standard" unit will be 4 x 8 man companies but small games will see companies as "units" and battalions as "brigades". Sequence of play. 2 options. Standard: IgoUgo with an initiative roll at the start of each turn. Within turns units are given orders and act 1 by 1 then combat is resolved. (Several units in a brigade can form up together and are treated as 1 for activation). Movement and combat is all resolved before the next unit is activated. Alternate: Draw cards, Red one side, black the other. On a card one unit or group of units is activated, moves and fights. esp if fighting at night, in fog or forest or if preferred. March/Work. The unit forms column and moves double speed to indicated target but may not shoot or attack and ends in march formation. Also used for pioneers to do work. Prepare. The unit deploys, ready for battle. May move 1/2 in any direction and change facing/formation. May not shoot or attack. The unit is ready to react to enemy threats. Attack. The unit must be deployed, facing the enemy and not disordered. Move towards the enemy or indicated position at normal speed. If they get close enough attacker may shoot first at 1/2 effect or let defender react first. Defender may shoot or retreat in disorder or test then charge or test then change formation/facing. Attacker may shoot if they didn;t shoot earlier or may charge. Resolve melee if there was a charge. If a unit attacks into an ongoing fight, only the defending unit is reactivated and it can only react to the attacker. No charge or formation/facing change is allowed as reaction in this case. Morale. A unit receiving 1/4 casualties (current strength) or more in 1 turn will turn and retire a move in disorder. A unit suffering 1/2 casualties (current strength) or more in 1 turn will rout and be removed. Shooting 1 die per 4 round up remainders over 1/2 6=2 hits, 4,5 = 1 hit. +1 cannister -1 vs artillery or cavalry or partial cover, -2 vs hard cover or skirmish -1 over 1/2 range 1st fire 1die per 3 figures. Melee Match up front rank figures and dice. High score hits. +1 elite or fighting militia, +1 defending cover or obstacle. +1 charging except vs square or cover. Afterwards Any forced to retreat do so. If still in contact, attacker falls back either 1" in good order or beyond enemy cannister/ small arms range in disorder. An imagined example with no surprise shift of initiative . The French stop at long range and opt to fire first. They will count 1/2 the figures in the front 2 ranks or 24 figures in all but for first fire will get 1 die per 3 figures with a -1 modifier for long range fire. 8 dice with each 5 or 6 indicating a one hit, They make fairly average rolls and inflict a couple of hits on each British line with no other effect. The British choose to hold their fire. That activation is over. The British move next and choose not to attack so there is no firing by either side. On their next move, French advance to close range and fire first again. Again they fire only 1/2 their figures but there is no minus 1 so 6's will be 2 hits and 4,5 1 hit. They now roll 6 dice (not first fire) they now score slightly higher than average and do 3 hits on 1 unit and 4 on the other but this has no morale effect. The British now return fire at close range with 1st fire. The line slightly overlaps the French so they end up with 5 dice against the center battalion and 7 dice against each of the flanking ones (1d per 3) and are looking for 4,5=1 hit, 6 = 2 hits. They inflict 5 hits on 1 militia battalion, 4 on the regulars and roll up slightly inflicting 6 on the other militia battalion forcing both militia units to turn and retire in disorder. The British move next and decide to fire first with 1/2 their figures, take the French fire then charge. The end result will depend on the dice but the odds should be in favour of the British sweeping the field. Now in keeping with a desire to reduce the number of games with stand in figures, I am going to set up a small War of 1812 action to test things out on the table. 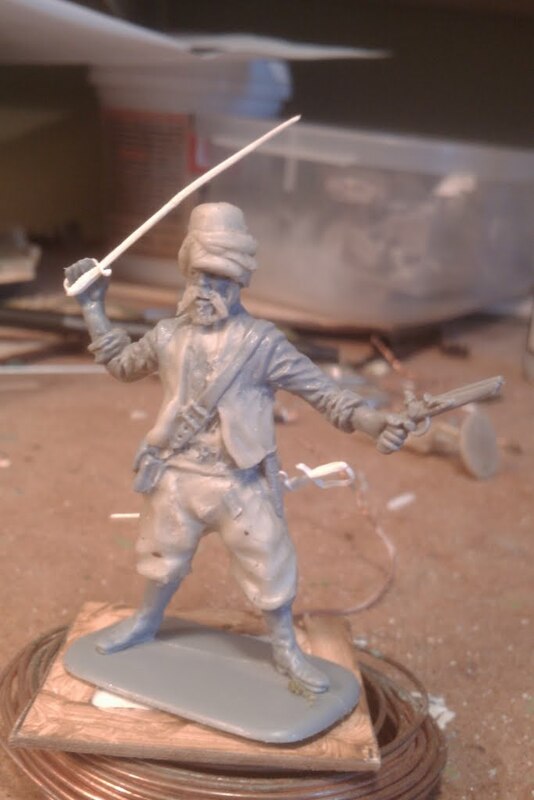 (and get casting and painting so I can get the mid-19thC guys into action again). OK, cooler heads have prevailed. 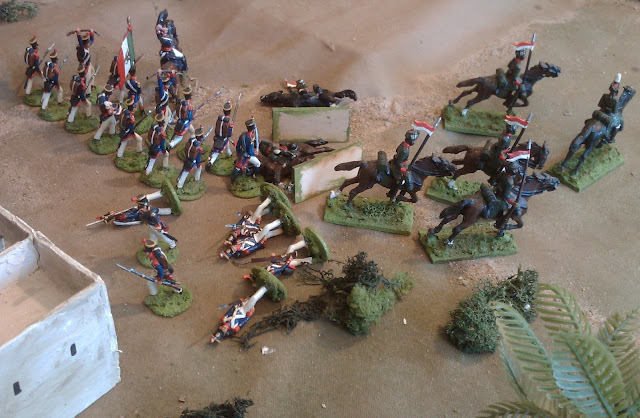 After handling a few figures and rereading some old posts (to avoid having to actually think the thoughts again and re-discuss the old discussions again), I have decided to again post pone the late 19thC/early 20thC glossy toy soldier adventure and to stick to last year's decision to park the historical early 19th campaigns for a bit longer and just get the Atlantica collection sorted. I have also remembered 2 of the stumbling blocks. One is that I need to sculpt some more figures and have been stalled on the sculpting side. The other is that while I have a vague of idea of how I want the games to look and feel, its hard to write vague rules! I could just stick 'em all back on bases and play Hearts of Tin but I want the games to look and feel different (largely as an excuse for multiple collections of troops). So here I am looking at Charge and fiddling with MacDuff again and wondering if its fair to use the same name if the rules end up being very different and wondering what else to call them. OK that can wait. What I found myself writing last night when supposedly updating the intro, was a rant on consistent scales and the dampening effect it can have on games design, esp since no one I've met, other, perhaps than Von Reischwitz, has managed the time issue and he wasn't writing a solo or 2 player game but a training exercise with a team of umpires. Time and interactiveness are the real difficulties. The rate at which troops move is also easily calculated but is meaningless without a time scale and time scales which give reasonable bounds on the table are usually incompatible with the total length of time required for even a small battle. All of this is of course old hat well discussed in the 60's and probably earlier. There is always the design for effect but the trick is to get the right results/effect without losing all flavour, especially if playing a low level action rather than a large battle where the player is a Corps or Army commander, above the smell of smoke. It would be fine if skirmishes between less than 1,000 men were usually over in 20 minutes, but based on studying various War of 1812 actions amongst others, such things could easily last 3 hours or more despite the lack of troops. In real life, hurry up and wait applies, there are pauses where not much happens, then there is a burst of activity then another burst of activity. How best does one get this on the table top and keep it interesting? There have been lots of attempts to find the best way to convert the continuous flow of time into a game format, from IgoUgo, to simultaneous moves, continuous action, variable length bounds, impulses, card decks and on and on. I'm afraid I'm not bright enough to out think all those who have given it a go in the past but I'm still struggling towards finding something to suit me right now. At least, since this is to be primarily a solo project, I don't really have to worry about finding something that works for any one else. I'm currently revisiting an old idea that almost worked. On a high level, it would involve fairly long movement with some sort of reaction-interference by the enemy, an interactive combat resolution, usually decisive, probably with the possibility of more than 1 phase. There needs to be a reason to not commit all troops at once and there needs to be time to regroup but turns need to move quickly when there is little or no fighting.